Moorside Community Primary School, Ovenden, planted hundreds of daffodil bulbs on Thursday 6 December 2018 that will show a sea of yellow when spring arrives. The Junior Wardens planted the border areas along the driveway of the newly built school at Keighley Road, Ovenden, creating great displays that will go on for years to come. 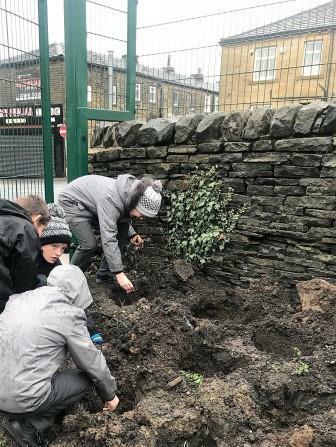 With help from The North Halifax Partnership, CMBC Community Warden and Calderdale Council’s Safer Cleaner Greener Team who worked alongside the Junior Wardens from Moorside Community Primary School in the planting and management of their local environment. ← North and East Halifax Friday Flyer 7 December – OUT NOW!